Description: A newly renovated one storey house with a 85sq. meters built area on a 1200sq. meters plot. The house consists of Lounge, Kitchen, Two Bedrooms, Bathroom and WC. Extras: PVC window frames, laminate, hardwood. As you can see on the pictures the house is in very good condition. 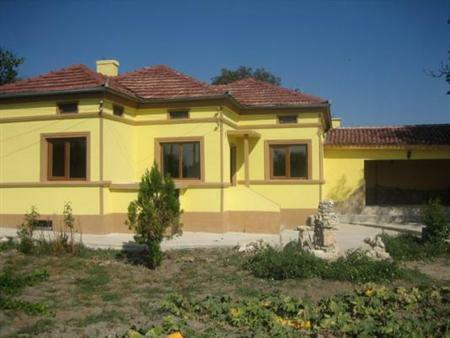 One storeyed country house in a nice village near Dobrich town and 44km from Sandy Beaches. The village is very sunny and quiet. The region around it is agricultural and ecological clean. It`s only 40 min. drive to Varna airport. There is is a LAKE available for fishing. The people living in the village are friendly and all neighbors around are producers of fruits, vegetables, cheese, milk and etc. A great opportunity to buy from them natural fresh and clean food two times cheaper than in the super market. The property has running water and electricity connected. Telephone line and cable TV are available. The house comes with 1200 sq.m. yard which can be split into two building plots. Buy now to have your own peace of paradise on Earth!